Imagine your home on a small patch of land with water encroaching from all sides, living with the constant knowledge that it is only a matter of time before you are completely submerged. Now replace the house with a country. That is what climate change is doing to several island countries for whom global warming is a real, present danger, not an abstract concept to be discussed in seminars and negotiated for years. Among the worst hit is the small island nation of Kiribati in the Pacific Ocean, whose President Anote Tong says they are “already doomed” whatever the outcome of the climate conference in Paris. Kiribati is facing severe coastal and land erosion, so much so that the whole country is likely to be submerged in the next 30 years leading to the displacement of its entire population of 100,000. 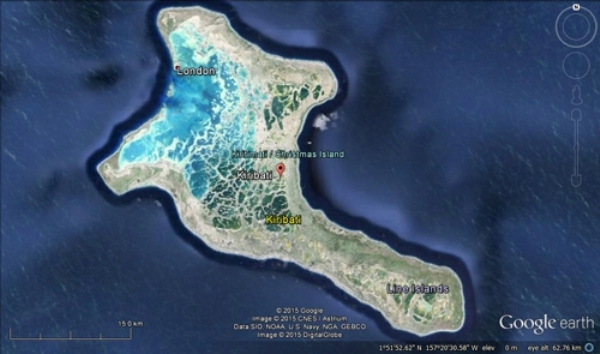 In desperation, Kiribati has even purchased land in Fiji for its people to relocate if the island is engulfed by the rising sea. A climate change warrior who has been trying to draw the world’s attention since early twenty first century, President Tong is hoping for some sort of a package to help countries like his that are sinking in the ocean due to the action of the other developed nations. With the India-Africa summit in New Delhi scheduled at the end of October, Prime Minister Narendra Modi will be quite aware that African heads of government will also be seeking India’s help to get similar packages. President Tong and other leaders of Pacific island nations made an impassioned plea to Modi for help when he hosted them at a similar summit a few weeks back. How do you as a country manage to live with the constant awareness of this impending danger that your islands will soon be under water? Let me begin by expressing how grateful I am to get this opportunity to tell our story. It’s a story that I have been telling over more than past 10 years and we have been trying to find how to respond to this (situation). Many of our own people don’t know about what is coming and I never believed that it is in their interest to tell them everything that is coming, because it doesn’t serve any purpose; because it is very little, if anything, (that) we can do about it. At the government level, what we are trying to do is examine what is happening at the moment on the ground and what is happening is not a good thing. Some of the communities had to already relocate, some communities are not in the point of relocation, and they continue to deny that they need to relocate. But I can see this happening very soon. Within the next five years, there are going to be a number of communities that would have to relocate. What makes you think so? What sort of problems are you facing? They (sea) are damaging the freshwater links, food crops are being destroyed and there is no way they (the inhabitants) can continue to live on those islands. We are seeing damage from the extra high (tides), we did not experience this before. It is happening in different parts of the country. Our islands are very scattered. Sea walls are to be built so that they can be secured for some time; compensation for lost property and lost food crops need to be given but we do not have the resources to do that. In the beginning of last year, we had some extra high tides and lots of them (people) sustained damages. Earlier when our southernmost islands were hit by cyclone, the reality dawned on us. Being on the equator, we have never experienced cyclones earlier. So the combined experience of cyclone and extra high tide has put fear in the hearts of people. It is a fact that our homes will not be there in 20 years unless there is going to be a commitment of very substantial resources to build up or find a way for our population to survive the rising sea levels. What is your roadmap for Kiribati? We think we have the time so we have to embark (upon) a programme of skill development of our people and training them. So when they migrate they don’t have to migrate as refugees. We can spread it over 10-20 years, rather (than waiting) for 10-20 years and then discover that we have to move. Absolutely, we are looking at all options including reclamation and building up. We are looking at the technical issues we are still trying to address, and we are working with people and partners to invite them to come up with solutions. What are your expectations from the Paris climate change conference? Are you looking at a package from the developed nations? What the Paris meeting will come out with is probably reduction in greenhouse gases; may be some commitments to control the rise in temperature, but that will not have any relevance to our future. Whatever happens in Paris we are already doomed. So yes, we are trying to shape a package not a lot of people and countries understand. While talking about the situation in my country I have always been talking about situation of countries in similar situations. Most of the islands within the Pacific area will be affected. In Indian Ocean, Maldives and of course Bangladesh will be affected badly. The global community has a duty to help those of us who are already a victim of this climatic change because if that does not happen then what’s the meaning of humanity. You had a meeting with Indian Prime Minister Narendra Modi. What was your take-away from it? We met in Fiji when Mr. Modi had come. That meeting was very positive and I have a feeling that he has a genuine desire to do something about climate change. I know India has a huge issue and I agree that fossil fuel is a good resource but we need to understand that (if) we do not cut down on the use of fossil fuel, it would affect the future of so many people. Hence we should deal with it with commitment and compassion.